You're engaged? Congratulations! To get a head start on creating your idyllic day, join Villa Maria Estate for a dreamy wedding fair. The months ahead, though wonderful, will feel like such a whirlwind and with that comes a number of boxes to tick. Which venue to choose, which gown gives you that feeling , what flowers match your theme, which colour palette suits the season - it’s an endless kaleidoscope of possibilities. So, how do you begin? Wedding fairs are often a great place to start. Held in beautiful locations where multiple vendors come to exhibit what they have to offer, they are great if you are in the early stages of planning. From cake to photography, you'll be faced with a wealth of options. As well as your list of necessities, take your bridesmaids or your fiancé, and enjoy the experience. At the Villa Maria Estate , you'll be spoilt for choice. Set amongst rows of vineyards within a 20,000 year old extinct volcano, it's a picture-perfect location for your wedding day. On Saturday April 6th, they are hosting a dreamy day of decadence at their Mangere estate where you can spend the day taking a peek at the best the wedding industry has to offer. 1. Did you say, wine? It's what this flagship Auckland winery does best. At their wedding open day, you'll be able to browse the collection to see what would complement your special day. 2. A bespoke bridal-wear showcase by Jane Yeh will debut the best of the season for brides-to-be. 3. Makeup and hair consultants will be on hand to make sure you opt for the style that suits you best. 4. It's going to be full to the brim of industry-leading wedding suppliers ready to tick all your boxes. 5. Goodie bags for the first 100 attendees - it's a day that keeps on giving. Interested? Download the comprehensive Villa Maria Wedding Brochure here , or for more information and full contact details visit their website here , or their Instagram page here . 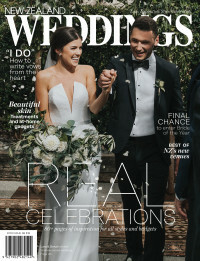 What's In The New Zealand Weddings' Planner?